Discover the Igreja dos Terceiros de São Francisco Church in Porto. 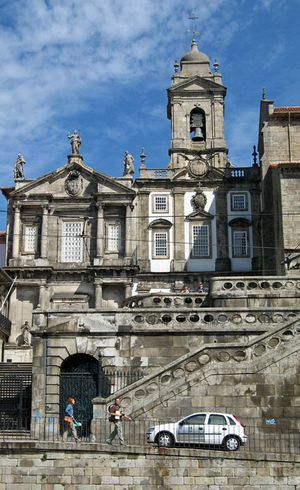 The Igreja dos Terceiros de São Francisco Church is located on the Praça do Infante D. Henrique Square, in the beautiful city of Porto. This church, together with the Torre dos Clerigos Tower and the Sé do Porto Cathedral, is one of the most important religious monuments of this city. Don’t miss visiting it! This church has a modest facade Gothic-in-style. In its interior you’ll find one of the best Baroque exhibitions in Portugal. This church was built between 1383 and 1410 and restored in 1425 when the domes where built. It was built through the 17th and 18th centuries. During this period the eight altars were covered with more than 100 kilograms of golden leaf. There was so much gold that the church was closed to public after affecting the nearby poor villages. Underground you will find the catacombs, where the rests of many noble families rest together with their Franciscan brother. At these catacombs, apart from numerous tombs you’ll be able to observe a chapel filled with numerous human bones through a window positioned on the floor. Next to it is the Palácio da Bolsa Palace, which is also worth to visit. Praça Infante Dom Henrique, Porto. From November to February from 9:00 to 17:30. From March to October from 9:00 to 19:00. From July to September from 9:00 to 20:00.